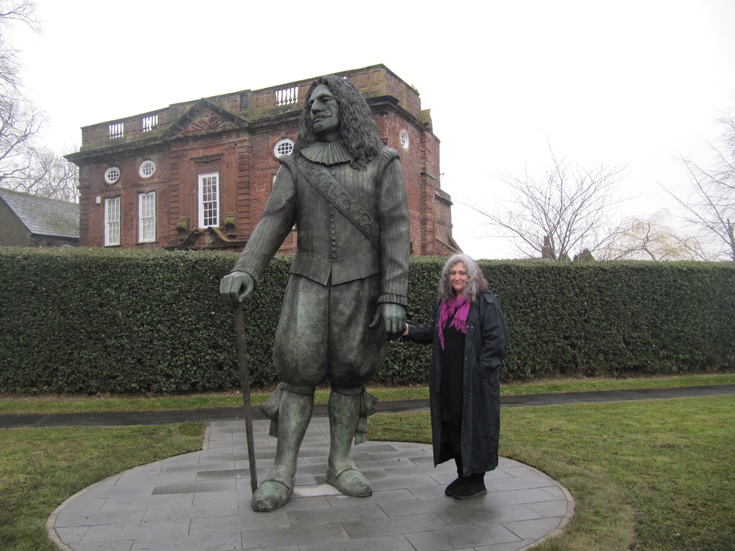 Diane designed and made this bronze Childe of Hale - with some assistance from Phil. The work depicts the Childe wearing his fine clothes, taking a pause to look at his home. It was cast by Castle Fine Art Foundry and installed by them with Phil's assistance. Click here for more information about the commission and unveiling. Hale Village used to have a sculpture of the Childe carved by Phil - with the assistance of Geoff Wilson. They carved the dead beech tree opposite the Church (where the Childe of Hale is buried). After 16 years the tree had to be taken down due to disease. Click here for more information about the Childe of Hale. Photo credits: The first photo is by Hannah Mudd. Move mouse to see photo by Caroline Silverwood Taylor on the left, the photo on the right is by Phil.